We understand that divorce is never easy. There are numerous decisions that have to be settled, including what happens to the home. There are generally two choices when discussing common real estate - it can be sold and the proceeds split, or one party can "buy out" the other. In either case, one or both parties would find it in their best interest to commission an appraisal of the mutual real estate. An appraisal for divorce purposes should include a well-established, authoritative report that will hold up to a judge. When you order an appraisal from Houston Appraisals LLC, you are assured the best in service with professional courtesy and top notch analysis. Through experience and education, we've learned how to care for the sensitive needs of a divorce situation. 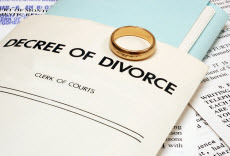 Contact us if you require an appraisal related to a divorce or other division of assets. Ohio attorneys as well as accountants depend on our opinions when determining what real estate is worth for estates, divorces, or other disputes needing a value opinion. We understand their needs and are accustomed to dealing with all parties involved. We assemble appraisal reports that fulfill the requirements of the courts and various agencies. As an attorney dealing with a divorce, your case's evidence typically needs an appraisal to determine market value for the residential real estate involved. Often the divorce date may not be the same as the date you purchased the appraisal. We're comfortable with the methods and all that it takes to perform a retrospective appraisal with an effective date and Market Value conclusion corresponding to the date of divorce. For each divorce appraisal we are hired to do, we remain conscious of the fact that they need to be handled with the utmost care. The ethics provision within the Uniform Standards of Professional Appraisal Practice (USPAP) compels us to keep the highest degree of confidentiality, guaranteeing you the utmost discretion.